If your dog is 6 months or older (or a large breed at least 4 months old), our Beginning Obedience class will help you build communication with your dog, establish your leadership, and learn how to start changing problem behaviors into "good dog" habits. Our 7-week Dog Obedience classes conclude with a "graduation" at the last meeting. Each dog will be tested and scored on his Novice Obedience exercises, and will be presented with a diploma. Trophies are awarded to the three top scoring dogs in several divisions. 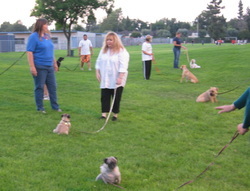 Find A Beginning Dog Obedience Class! Many classes are "co-sponsored" by neighboring cities and you will have a choice of where to register. The schedule below shows CLASS LOCATION followed by the cities which offer registration for that class location. Clicking on the city will take you to the class description and registration information. You may register for a class through any city where it is offered, regardless of where you live. However, some cities do charge a Non-Resident fee, so you should review all the options listed before deciding where to register for a class if you don't live in that city.